Does Your Hair Need More Slip or More Grip? A few weeks ago, about half of the Rick Mosley Hair team attended an event and class led by Bea Watson, Aveda’s Global Hair Style Educator in London. Bea was in Des Moines to spend a day sharing the latest styling and product tips, and a second day giving hands on experience to a group of select local stylists. Our team enjoyed the experience and came away with quite a few of the hottest styling tips. While none of the below product uses are “official,” we wanted to share these secrets with you so you can try them at home! Aveda’s Be Curly Curl Enhancer – This great product has a polymer in it that remembers your curls. This means it not only helps with your current style, it helps maintain your perfect curly look the next few times you style your hair. Aveda Men’s Pure-Formance Firm Hold Gel – Women have secretly been using this men’s product to add more volume and grip to their hair. While other products provide every day volume, this one is great to use on roots for special occasions and all-day hold. We’ve tried it several times on salon customers recently with great results! Aveda’s Shampure Dry Shampoo – Yes, it is true! Aveda just released a new dry shampoo. This new product is going to be a game-changer for customers who want to make flat, greasy and even sweaty hair look presentable in a flash. Watch our blog for a product review in the next few weeks. At Rick Mosley Hair, we’re committed to keeping up on the latest trends and techniques, and this includes investing in our team by hosting and participating in training and classes all year round. Stop by today to ask your stylist about what he/she has learned recently! Already Stressed by the Upcoming Holiday Season? Aveda’s stress fix products make great holiday gifts. Stop by Rick Mosley Hair to pick some up today. Melt your stress away with the aroma of lavender, while moisturizing your skin with the power of essential oils by using Aveda’s Stress-Fix body lotion or concentrate. Chose our hydrating body lotion for a mini spa treatment whenever life gets stressful. The scent is proven to relieve feelings of tension and anxiety, so be sure to hold some in your hands and under your nose while taking a deep breathe before using. Next, smooth over your body in a circular motion, while providing the most attention to your shoulders, neck and forearms. Give your hands a pick-me-up thumb massage whenever they get dry throughout the day, especially if you wash your hands repetitively. When you’re on the go, reach for Stress-Fix rollerball concentrate. Simply glide it over your pulse points – inside of wrists, top of neck, upper shoulders – for quick relief. The portable size fits perfectly in your purse so it is always with you and available. And, the light scent is strong enough to make you incredibly happy, without overwhelming your friends. These products are organically certified by ECO-CERT, a private international organic certification agency. To qualify for this honor 95 percent of the product (including water) must be of natural origin, 95 percent of plant materials must be certified as organic, 10 percent of the total ingredients must be certified as organic, and the product must be manufactured in a facility that meets ECO-CERT’s high standards. This is important because of Aveda’s long-term commitment to being an environmentally responsible company. The next time you need instant calm and relaxation, or even a better night’s sleep, turn to Stress-Fix body lotion or rollerball concentrate to help melt away your tension. Stop by Rick Mosley Hair and ask for a free demonstration of these luxurious products that also make great holiday gifts. A Color Correction Battle – and WIN! My hair-coloring nightmare took me to four different salons in Central Iowa for appointments and six corrections. My hair went from natural and shiny to stripes of blonde, hues of orange, yellow blonde, and even to light brown. Then one day about six weeks into this hair color ordeal a friend suggested when I next saw someone’s hair that I liked, to just ask them where they got their hair done since it likely is a shop that has good technique and quality, as well as the ability to communicate and interpret what the client wants. The next day when I was at the grocery store I saw a woman with perfect color. It looked natural, so I asked her where she had her hair done. She told me Rick Mosley Hair, so I called and made an appointment immediately. At my first visit to Rick Mosley Hair, my colorist was finally able to give me the look I was hoping for – the look so many other colorists in town couldn’t provide. When I stood at the checkout counter after seeing my new hair miracle, I was so grateful that I had to choke back tears. She brought me back to being myself and it was done at a lower price than I expected. When you go to Rick Mosley Hair, the overall experience is enjoyable. I am treated with respect, and the stylists are genuine and down-to-earth (yet, refined and polite). I now go to Nicole for most of my services, and she has also provided wonderful, consistent experiences. Everything is perfect, even down to the details at the salon – capes are used to protect your clothing, the lighting is wonderful, the privacy is just right, and they make me feel ready for a night out on the town. Their Aveda products are great, yet not pushed on you. To sum it all up, I am relaxed and confident when I’m at Rick Mosley Hair. The hair ordeal I described was two years ago, and I continue to return to this salon because not only did my impossible color mess get fixed, but the colorists at Rick Mosley Hair are able to consistently maintain my color and look. The salon meets me where I am financially. They listen to what I want and are able to decipher what I want from what I said – every time! Rick Mosley truly cares for his employees and his clients. He invests in the education of his hair designers and color specialists. And, his team is natural at customer service. Thanks to the Rick Mosley Hair team. I am a client for life! What’s the Latest in Men’s Hair Trends? Why does it feel like women’s hair cuts change with every season, but men’s styles seem to last a lifetime? This season is no different, with one cut that can provide both formal and messy options to best fit your personality. 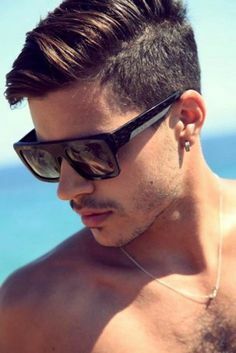 The pompadour with different lengths – typically short sides and a more disconnected and longer length on top – is showing up as this season’s top pick. Longer length on top with shorter sides and back can help you achieve two great looks! Want to emulate the popular and sleek Mad Men style? Then a slick and precise side part is for you. 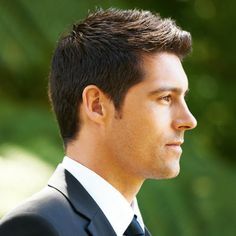 This more refined look can support some length on top, but looks best with shorter hair in the back and on the sides. The tidy edges of this cut should be finished with a bit of Aveda Men Pure-Formance Pomade to add shine, texture and definition. If your attitude is a better match with a more natural or shaggy style, there also are options for you. The “bedhead” look works well with naturally wavy hair that also has a bit of length on top. The key is making sure your hair has lots of added texture and volume. Aveda Men Pure-Formance Grooming Cream adds pliable hold and control while maintaining a natural look. While both styles have similar cuts and are easy to care for, they require just a bit of effort each morning, as using the right products is more important than ever. Which of these two prominent men’s styles will look best on you? Set up an appointment with one of our cutting specialists at Rick Mosley Hair so we can help you match your own personal style. While I rarely watch television, I learned about the new reality dating show, “Ready for Love,” while watching “The Voice” with my kids about a year ago. I saw a commercial to go online and apply, and thought what the heck! I have never done anything like this before, but took a leap of faith that resulted in a Skype interview with the show’s casting agency. The agents must have liked me, because they pitched me to NBC – and the network approved! Overall, the process involved tons of paperwork and everything moved very quickly. To make a long story short, last Memorial Day I found out that I was selected. I only had five days to get everything together before flying to California where I met with a matchmaker who had to think I was a good fit for one of the show’s three bachelors. After several days of interviews and photos, it was finally time for our stage days. Call time was 4 a.m. and we were not done filming until 1 a.m. Once Ben (one of the bachelors) chose me to continue, I moved into Pacific Palisades with eight other women. We lived in the house that Rihanna recently purchased, which was pretty cool, but also full of drama. I have been a loyal client of Rick Mosley Hair for at least 15 years, after a friend referred me. I have tried other places, for convenience sake since I live an hour from the salon, but nobody can color or cut my hair the way Rick’s team does. Overall, the show was a great experience. I have made great memories and friends. And, even though I didn’t find true love, I have no regrets and am proud of the way I represented Iowa. This photo was set up to look like the Shampoo movie poster with Warren Beatty and Julie Christie in the mid to late 70’s – early in Rick’s career! Have you ever wondered what happens each day behind the doors of Rick Mosley Hair? Maybe you drive by on your way home from work or see our storefront when picking up dinner at Dish. We understand that selecting a salon can be somewhat intimidating, so whether you have been a client for years or you are considering a change, let us (re)introduce you to our experienced (and fun!) team of professionals. Rick Mosley first opened the doors to his namesake salon – Rick Mosley Hair – during the floods of 1993 in the heart of Valley Junction in West Des Moines. Prior to that, he cut hair at several other big-name salons in town. Remember “GLC Haircutters,” the spaceship shaped “Headliners,” or “Phases Hair Salon”? Since the beginning, Rick has devoted his time exclusively to excellence in the art of haircutting. His unique styling and business approaches have earned him a large and devoted client-base that keeps him on his toes. Two stylists – Karla, Rick’s good friend and Terri, Rick’s sister – began working at Rick’s side from the very start. Together, they make up the core team that has been making our clients look good at Rick Mosley Hair for nearly 20 years. In 2003, Rick decided it was time for a change and relocated his salon to our current location inside the Anglo building in Clive. This is when he also began encouraging his team of stylists to grow as specialists in the field of their choice by bringing a trend in the hair industry called “departmentalizing” to Des Moines. This approach aligns with Rick’s vision and background in the field of hair cutting, and allows our team members to specialize in the services they are not only best at and most confident in, but also that they are most passionate about. The approach is similar to how doctors learn all of the basics first and then move into a specific field. It is natural instinct for most stylists to feel more confident in one practice or the other – cut or color. While our “dualists” Karla and Terri continue to provide both cutting and coloring services, we also have four stylists – Rick, Andrea, Tony and Nicole R. – who focus solely on cutting and styling hair. And, the rest of our team – Jenna, Nicole H. and Abbey – exclusively specialize in hair color. This creates an inspiring environment for the team to work and grow in. According to Rick, “Life is proof that great ideas work, because here we are 20 years later still going like gangbusters with a team of colorists working along side a team of haircutters.” Learn more about each of our team members on our Website. Please plan to stay in touch with us either between your appointments or as you become more familiar with Rick Mosley Hair by following this blog. We know that hair can sometimes be challenging, so we’re also open to answering your questions. Submit them to info@rickmosleyhair.com and we’ll do our best to respond.